Spring is officially here! 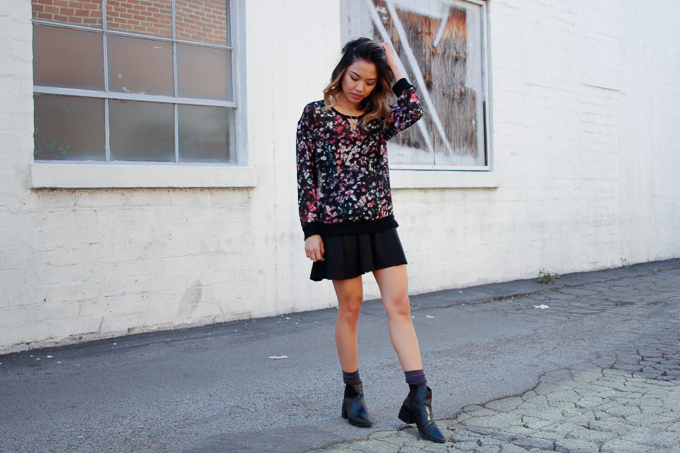 What better way to welcome the longer and warmer days than with a floral sweater/pullover shirt. This pullover has been my favorite transitional piece in my closet. I've worn this pullover during a gloomy winter day to brighten my look. This has been one of my go to sweater especially on days when I need something to cheer up and brighten my look. I like pairing this sweater with darker color (like with a darker wash pants as seen on this post) since it creates a nice contrast to the whole outfit. I've had this pullover for awhile now, so it's no longer available. However, I did find this one that has as slightly larger print, but just as bright and colorful. Or recreate this look with a hooded version while it's on sale for $13! Speaking of spring, I did some spring cleaning over the weekend as well! I listed more items from my closet on Poshmark. I hope you'll it check out some of my pre-loved items.